Feb. 6 – Day with Hedges v. Obama | Stop the NDAA! Anyone interested in this pivotal case should attend. The goal is to pack the courtroom. An overflow room with the proceedings screened may be provided. We ask that you remain silent and respectful while in court; no signs, talking or gestures. The trial is expected to take approx. one hour. Respectful individuals and organizations are invited to participate with the intention of providing the media with a clear and pointed message about the critical nature of this case, and our need to reach the mainstream. Can you join a crowd behind the press conference and have your presence be your support? Signs are great. We strongly encourage and request a subdued, visually conservative gathering. We appreciate your support and understanding of strategy here. Pentagon Papers Whistleblower Daniel Ellsberg, Pulitzer Prize Winning Journalist Chris Hedges and most of the Freedom 7 address U.S. Government’s Assault on Civil Liberties. 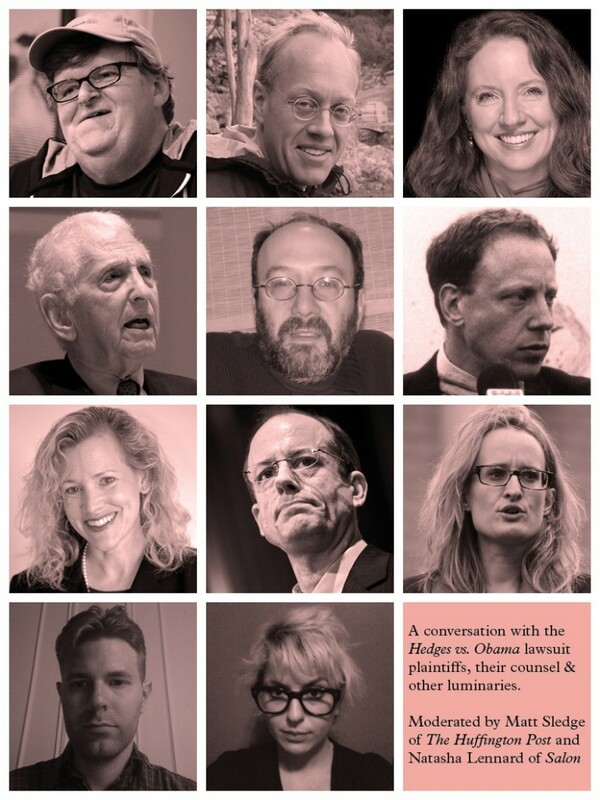 Join us at a split panel discussion on Hedges v. Obama and a pattern of abuse, intimidation and assaults on liberties. The event will be followed by an audience Q & A. This is a SMALL venue! There will only be around 150 seats available for this live panel, so come early! And don’t worry, if you can’t make it the event will be live streamed and links to the streams are coming up shortly! I want to sincerely thank Mr. Hedges, Ms. Bolen, Dr. West, Mr. Ellsberg and the others who are taking this on. I am a father with two children who is extremely concerned with their future in this country. I’m also, admittedly, a member of the mainstream media machine which shapes, distorts, twists and omits news and non-news. I am faced with this moral dilemma each day. While I cannot quit my job, I can only hope to do my best each day to engage and inform my colleagues about the extremely important issues that Mr. Hedges and others have taken up for all of us. Thank you again. I hope you didn’t use your real name! What the f? Why does the video of cut off Chris Hedges when he was getting into the encroching military state and cut to Alexa? Lame. The stream is impossible….very intermittent 90% silent so far, I hope the whole of this is recorded and up on youtube asap. I’m one of the 67 users who wanted to follow today’s proceedings via UStream, but so far I’ve missed most of it because UStream isn’t working properly. How are we supposed to build and sustain a mass movement if we can’t even get a simple UStream connection working? Is there a summary anywhere yet of what actually happened? As it turns out, I found this: http://www.courthousenews.com/2013/02/06/54640.htm and http://www.salon.com/2013/02/06/ndaa_is_back_in_court/ .